The brevity of Maurice Sendak’s children’s book Where the Wild Things Are – its story contained in only a few hundred words and a few dozen pages of illustrations – shows the other side of the coin of the problem of literary adaptation to, say, Watchmen (2009). Instead of what Zack Snyder had to do with that film, i.e. condense a large, sprawling work down to a coherent audience-friendly narrative, the job for director Spike Jonze and his co-screenwriter Dave Eggers has been to conjure up a feature-length picture from the bare bones of a relatively sparse source. In theory at least, this should be the easier task, and one which opens up the possibilities of exploring avenues of theme and character absent or not fully fleshed-out in the book. In fact Jonze and Eggers have gone one step further in overlaying broad new ideas over the story’s template. The approach has worked to a large extent; Where The Wild Things Are has benefited greatly from this room for manoeuvre which has allowed both of their distinct authorial voices clearly to emerge in its story. Yet the lack of narrative meat in the source material proves to be the root of film’s biggest weaknesses. Sendak’s simple story centres on a young unruly boy named Max who one day travels by boat to an island populated by large hairy monsters; they duly appoint him king and he remains for a while as their monarch before returning home. The most immediate difference that Jonze and Eggers make is with Max himself, rounding out his personality and back-story by making him emotionally isolated – apparently friendless, his mother frequently busy with work or with her gentleman friend, his teenage sister hanging out with her friends – an isolation which causes or at least exacerbates his tendency for violent tantrums. Max is a creative child, a teller of fantastical stories, so when he eventually runs away from home to set sail for the imaginary island of monsters we can expect it to be a product of his imagination. Once on the island and acquainted with its inhabitants, what swiftly becomes apparent is that there is something deeper going on: again supplementing the original book, here in the film the monsters are all physical manifestations of the different sides of his personality: most immediately the short-fused Carol, quick to lose his cool and throw a wobbly, represents Max’s ill-temper, but so too the timid, seldom listened-to Alexander who personifies (or monsterifies?) his loneliness, and the elusive K.W. who appears to be a product of with his longing to be close to his sister. It is a novel approach to interpreting and expanding on the book, and is particularly effective in developing the bildungsroman idea of maturity deriving from a loss of naïve innocence and the discovery and acceptance of both one’s own imperfections and those of others. The stories we tell, whether we are a child or a successful filmmaker, are in some way reflective of our own subconscious. As such, as Jonze has been keen to point out, this is an often melancholy film about childhood rather than for children, and a PG certificate and a frequent sense of fun should not be enough to dissuade otherwise. This setup is very elegant, but such pop-psychology does not make for a good film in itself, and for all of its merits there is a feeling incompleteness to the film as a whole, a problem which seems to go back to the paucity of the Sendak source. The thinness of the plot renders large stretches of the film whimsical and at times, much worse, boring; it is the absence of what forms the basis of many classic films from The Wizard of Oz (1939) to Labyrinth (1986) and beyond: a central quest or goal to sustain the film for its duration. Max’s self-discovery comes as a character development but not a dramatic one; indeed his decision to return to reality comes late into the film and more as a product of fear of the island’s inhabitants rather than anything along the lines of a there’s-no-place-like-home feeling, by which time the inconsequentiality of the goings-on on the island have become more than a little tiresome. If Jonze’s previous feature films – Being John Malkovich (1999) and, ironically, Adaptation (2002) – have been narratively obtuse then it has been the sheer ingenuity of their Charlie Kaufman scripts which has kept them so watchable; here Eggers’ psychological insights come at the expense of a tight storyline. It is a shame that Sendak’s wonderful book has not made for the great film that it perhaps could have done, but I suspect there may be something inherent in the simplicity of the story which prevents it from translating to the 90-minute-plus mark. A shame, because it proves to be a rich resource of visual imagery, the scale of which translates comfortably to the big screen; the island and its natives are delightfully brought to life through a winning combination of puppetry and CGI, giving them a tactility and warmth lacking in so many other purely-rendered fantasy realms. 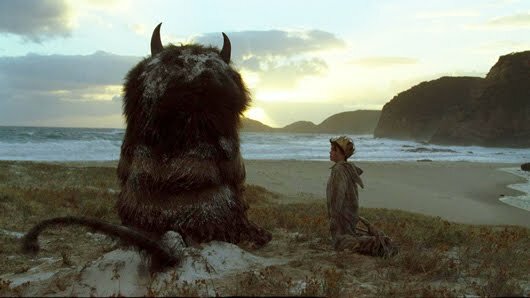 And a shame, since Jonze’s and Eggers’ vision of Where the Wild Things Are as a parable about innocence and maturity feels so very right.